Human impact is causing lower oxygen and higher carbon dioxide levels in coastal water bodies. Increased levels of carbon dioxide cause the water to become more acidic, having dramatic effects on the lifestyles of the wildlife that call these regions home. The problems are expected to worsen if steps aren’t taken to reduce greenhouse emissions and minimize nutrient-rich run-off from developed areas along our coastlines. The ocean is filled with a soup of bacteria and viruses. The animals living in these environments are constantly under assault by pathogens and need to be able to mount an immune response to protect themselves from infection, especially if they have an injury or wound that is openly exposed to the water. Louis Burnett, professor of biology and director of the Grice Marine Laboratory of the College of Charleston, and Karen Burnett, research associate professor at Grice Marine Laboratory of the College of Charleston, study the effects of low oxygen and high carbon dioxide on organisms’ immune systems. They have found that organisms in these conditions can’t fight off infections as well as animals living in oxygen rich, low carbon dioxide environments. The researchers examined fish, oysters, crabs and shrimp, and showed that all these animals have a decreased ability to fight off infection of Vibrio bacteria when subjected to low oxygen, high carbon dioxide conditions. It takes about half as much bacteria to administer a lethal dose to a creature in a low oxygen, high carbon dioxide environment. “Our approach is exciting because traditionally physiologists haven’t considered bacteria or disease as a natural environmental barrier, so it’s a pretty open field,” says Louis Burnett. Apparently, if marine animals are challenged with a pathogen, a large number of their blood cells disappear within a few minutes. The blood cells clump up to attack the pathogen, but also lodge in the gills (the sea critter version of lungs), where the body gets it oxygen. The scientists see evidence that sea animals fighting off infection lower their metabolism, which slows down other important processes like making new proteins. The researchers are now using microarrays to measure changes in gene expression in marine organisms that are exposed to bacteria under low oxygen, high carbon dioxide conditions. “After exposure to these conditions for only a day, animals at the molecular level have given up in trying to adapt to the situation, and they are going into molecular pathways that indicate cell death,” says Karen Burnett. 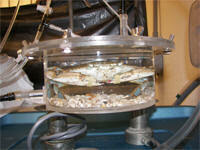 The coastal animals the Burnett’s study live in environments where natural levels of oxygen and carbon dioxide fluctuate. Theoretically, these animals are already adapted for varied environments, and yet they still struggle with these changing conditions. It’s alarming that deep-water animals may be much more affected by ocean acidification, since they are not used to the ebb and flow of oxygen and carbon dioxide levels. “Some of the models for how the coastal organisms adapt may help researchers predict how deep water organisms are going to be affected by overall climate change too,” says Louis Burnett.